This week, with Autumn underway and the swimming season slowly coming to an end in Australia, it seemed like the perfect time to examine one of Sydney’s popular swimming spots and pleasure grounds, Clifton Gardens. The postcard above shows Clifton Garden Baths, a popular swimming spot not only today but in years gone by. The swimming enclosure pictured in this postcard was very different to the one which remains at Clifton Gardens today. Although both were ‘ocean baths’ which permitted safe swimming in the harbour (though the shark proof net is apparently not particularly shark proof today), the original was unique in its design. Sometimes referred to as the ‘amphitheatre bath’, the huge circular swimming enclosure could apparently accommodate up to 3000 spectators on the decks! The enclosure was circular, surrounded by a two storey walkway which connected at either end with the dressing sheds (also apparently two storey). The baths were used for mixed bathing, both during the day and at night. To find out more about Clifton Gardens, visit last weeks post. 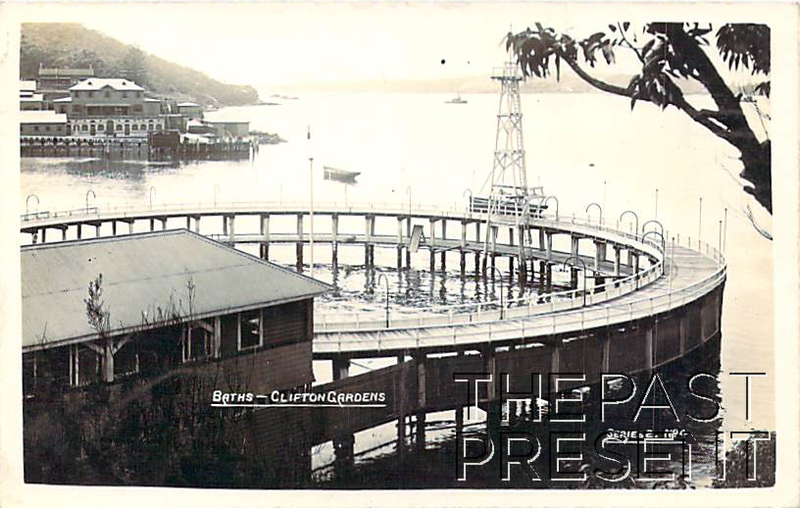 This entry was posted in New South Wales, Sydney and tagged 1910s, beaches, black and white, entertainment, leisure, parks and gardens, postcard collection, sydney harbour, tourism.